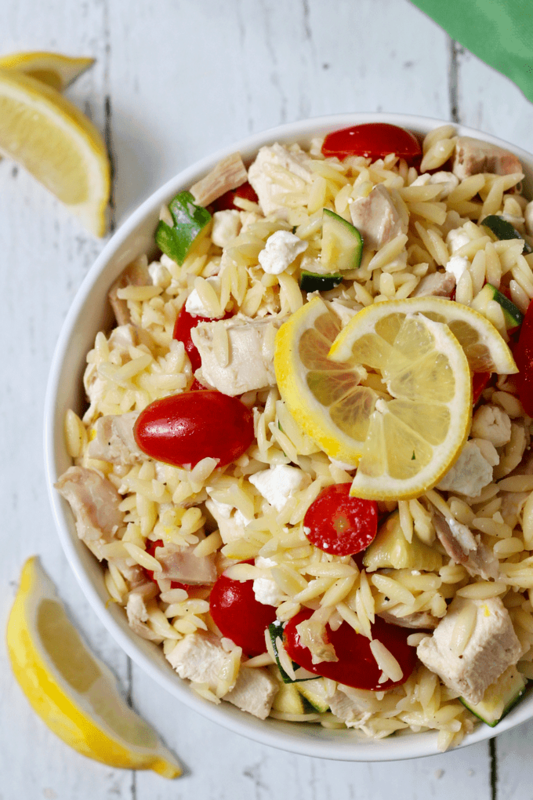 Lemony orzo salad with rotisserie chicken, tomatoes and crumbled goat cheese is an excellent light dinner (that makes fabulous lunch leftovers)! This is your answer to the post-holiday slump and to all the New Years hopes for lighter eating with great taste. 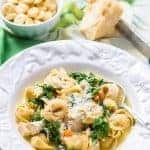 It’s a super simple – and fast – recipe to throw together, it’s all kinds of healthy and it has BIG flavor. I took this orzo salad to a friend of mine a few months ago who had just had twins. A group of us went up to visit, take dinner (and some extras) and help out. Those were two precious little girls I got to hold and love on. 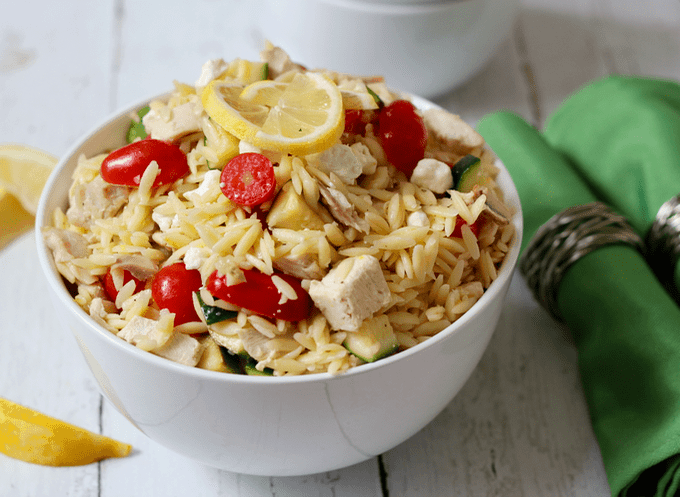 Later that week, the new mama emailed me and said they had eaten the entire batch of this orzo chicken salad in a couple of days. She said they were eating it for breakfast, lunch and dinner; couldn’t get enough! That’s new parents for you – your energy is low, your appetite is huge and you will shovel anything into your mouth with a free hand whenever you can. Enjoy the rest of the holiday season, and I’m wishing you a happy, healthy New Year! 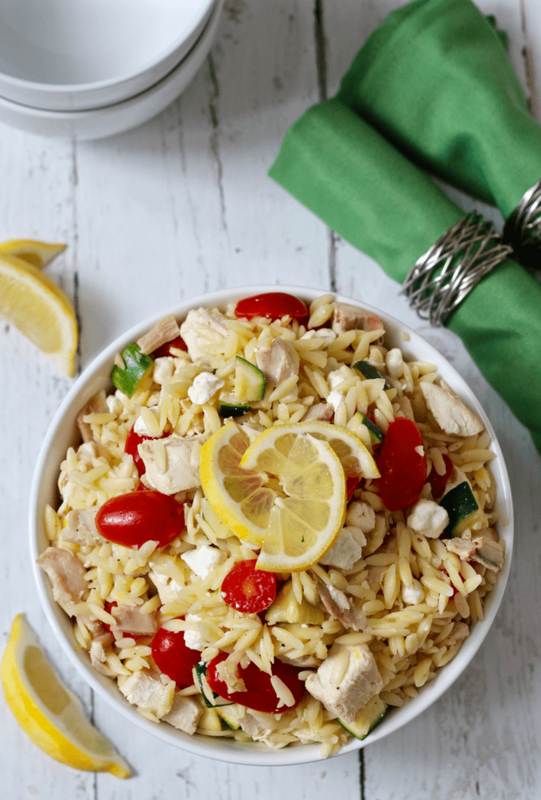 Lemony orzo salad with rotisserie chicken, tomatoes, zucchini and crumbled goat cheese is an easy 15-minute dinner! Chop the zucchini and place it in a large bowl. 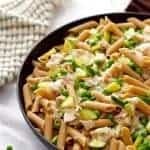 Once the orzo is ready, drain it and add it on top of the zucchini (which helps soften the raw zucchini just slightly). Add the zest and juice of the lemon on top of the hot orzo (the heat enhances the flavor and smell). Add the chicken, tomatoes, olive oil, salt and pepper and mix well to combine. Add the goat cheese and stir to combine, being careful not to break it up too much. You can add in some reserved cooking liquid if needed to help all the ingredients meld together. Serve and enjoy! Leftovers are great cold, too. If you don’t have any leftover or rotisserie chicken, you can sprinkle 2 boneless, skinless chicken breasts with salt and pepper, paprika and a little garlic powder then bake at 375 for 25-30 minutes. Let the chicken rest for 5 minutes, then slice and dice and it’s ready to go. I just love this kind of salad and my kids too. I will keep it in mind! How could this not sound good, right?! Hope you all love it, Adina! Thanks Cheyanne! 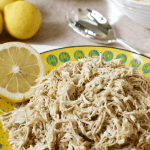 Lemon really does some amazing things to a dish… and I need a little lightening and brightening after all the holiday craziness! And yes, goat cheese can ALWAYS be found in my fridge 😉 Cheers girl! Thanks Cathleen! You definitely need to give orzo a try – it’s such a fun pasta 🙂 Happy New Year to you too! Oh, I love this. 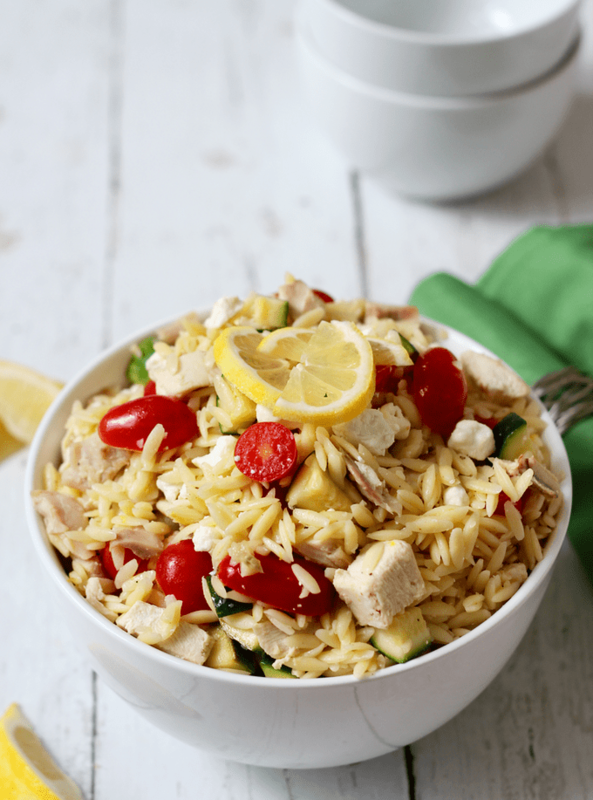 We love orzo, so this will be a great change of pace, especially after all the over-indulgence with the holidays. Bring on the fresh, healthy flavors 🙂 Thanks for bringing this to the Throwback Thursday link party this week! 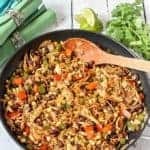 I love how fast orzo is – and how versatile! And yes to all the fresh, healthy flavors I can get this month! Wow this looks great! Ozro is one of those things I really miss since I stopped eating pasta due to allergies. But I think I will try making this with with my bean-pasta instead because Im so ready to leave all the heavy chistmas-food behind. I’d love to hear how it turns out with the bean pasta! I bet it’s just as light and fresh as the original – and I’m with you on needing a break from all the heavy holiday food! This does look delicious, I can see why they gobbled it up so quickly. Plus at that stage in the game, even warming something up can seem a little overwhelming so this is perfect! Thanks for the feedback Monique! It’s something I am considering adding, so I’m glad to know you would find it helpful. Stay tuned! oh this looks spectacular! I love simple salads like this! Yum! Thanks! Simple, fresh salads are the best 🙂 I hope you enjoy it! I added a jar of marinated artichoke hearts before adding in the cheese. It was a delicious addition. That sounds yummy! So glad you enjoyed it Philip! Loved this! Orzo is one of my favorite pastas. So simple to put together with all of the flavors of late summer. I just made this today, and I’ll definitely make it again. I went by the recipe, but I’m just not crazy for cherry tomatoes. 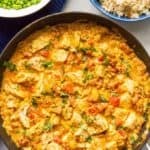 Is there another suggestion you would recommend that would give it a nice pop of flavor in place of the cherry tomatoes? Also, when stirring the crumbled goat cheese, I tried not to break it up, but it just kind of disintegrated into the mix. Is this because the orzo is too warm and would you suggest mixing the cheese after it is refrigerated? Thank you. Hi there! The goat cheese may have just melted into the dish if your orzo was super hot. You can always crumble the goat cheese directly on top of each serving when you’re ready to eat (and put any extra in the dish after it’s cooled). The cherry tomatoes give it a sweetness but also the juicy pop, and I’m not sure there’s an exact substitution. 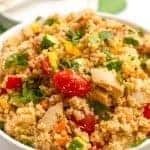 Chopped red bell pepper would add some sweetness and some olives might add a good juicy texture. I hope that helps! I’m so happy you found me! Yes – I do like adding a squeeze of lemon juice to brighten up the leftovers. A drizzle of olive oil would be great too. Or even some balsamic vinegar!